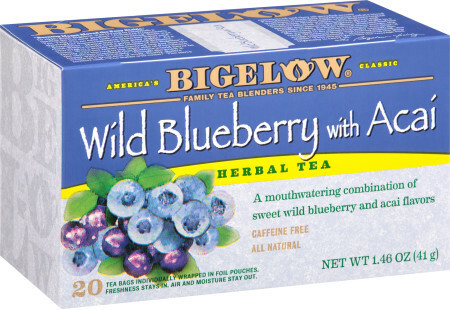 A mouth-watering treat for any time of day made with Bigelow Blueberry Acai Herbal tea. *You can use any assortment of fresh fruits depending on what is in season. Add a different flavor sensation by substituting one of Bigelow's Herbal teas such as Red Raspberry or Pomegranate Pizzazz in place of the Blueberry Acai. Add lime juice, water, sugar and Blueberry Acai Herb Tea Bags to a saucepan, simmer for 10 minutes to infuse flavor. Squeeze to extract as much liquid as possible then remove tea bags. Cool. Add fruit to large attractive bowl, pour syrup over fruit and toss gently. Garnish with mint leaves.